Are you a messy motion graphics artist? Sort your project panel, nice and neat. * Sort project items by type into folders which you can name. * Tidy only certain types, eg. Isolate missing footage or vector files. * Focus Tidy - Tidy within selected folders, none selected tidies everything. * Focus Tidy - Ignore selected - tidy everything except the selected folders. * Tidy Pre-Comps - Based on name, for instance all comps starting with 'Pre-'. * Remove unused footage button / Reduce project button / Remove missing footage button. * Remove all items containing text (input by user). * Folderize all items containing text (input by user). Any old folders are dropped into a folder called ‘Old Folders’- in case you need to re-use. 2.02 - Feb 2014 - Fixed bug, making copies of folders(empty)- when Tidy multiple times within a folder. 2.01 - Feb 2014 - Crash error fixed when nothing selected in project and Focus is ticked. 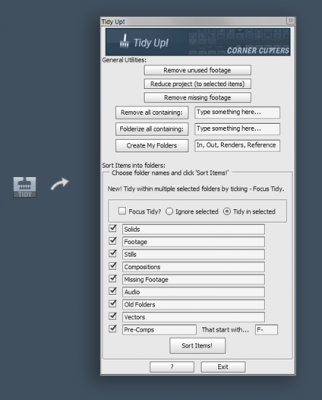 Textbox - Create my folders - user specified usual folder creation. Complete rewrite to support Tidy within selected folders. Pre-Comps, - based on how user names pre-comps eg. 'Pre-' . Launch error (needing Corner Cutters toolbar) fixed. Interface rearranged - Remove unused footage, Reduce project, Remove missing footage buttons. Textbox - remove project items containing user specified text. Textbox - Folderize project items containing user specified text.